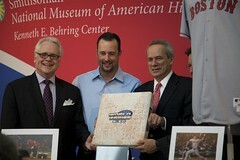 Red Sox President Larry Lucchino was joined by Red Sox pitcher Tim Wakefield at the National Museum of American History this morning, where the Red Sox donated artifacts to the Museum. They donated a Base from the 2004 World Series, and a Game-worn Jon Lester Jersey from the 2007 World Series. The artifacts will be on display on the 3rd floor of NMAH through this weekend, and will be part of a permanent exhibition to be named later. So, Red Sox fans, join the 2.5M people who’ve visited the NMAH since it reopened eight months ago, it’ll be worth it. Or, just watch Larry Lucchino donate the items, or hear the NMAH sing Take Me Out To The Ballgame. Ironically, Wakefield is older than most of the exhibits in the museum.